If you are thinking of making hijrah/moving overseas, obviously you will need a passport. Even if you are not leaving anytime soon, I highly recommend getting your passports now. It can save you a lot of headache in the future from having to rush and get them at the last minute (like we did). Where and How Do You Get a Passport? To obtain a passport for the first time, you need to go in person to a passport acceptance facility with two photographs of yourself, proof of U.S. citizenship, a valid form of photo identification such as a driver’s license, the correct fee, and form DS-11 (http://travel.state.gov/passport/forms/ds11/ds11_842.html) filled out but NOT signed. Passport acceptance facilities include many Federal, state and probate courts, post offices, some public libraries and a number of county and municipal offices. Or, contact the National Passport Information Center by calling 1-877-487-2778. Can I get a passport online? You CANNOT get a passport online if you are applying for the first time. You can only renew your passport online. How Long is a passport valid for? If you were 16 or older when your passport was issued, your passport is good for 10 years. If you were 15 or younger when your passport was issued, your passport is good for 5 years. For U.S. citizens age 16 and older: The passport fee is $55. The security surcharge is $12. The execution fee is $30. The total is $97. For U.S. citizens under Age 16: The passport fee is $40. The security surcharge is $12. The execution fee is $30. The total is $82. How do I check the status of my passport? The National Passport Information Center is the only office that can check the status of your passport. National Passport Information Center 1-877-487-2778. Do I need a passport/visa to travel to a specific country? In certain situations, however, foreigners are required to obtain exit visas from the Immigration and Passport Authority headquarters in Sanaa. These cases may include, but are not limited to, foreigners who have overstayed the validity date of their visa; U.S.-citizen children with Yemeni or Yemeni-American parents who are not exiting Yemen with them; foreigners who have lost the passport containing their entry visa; foreign residents whose residence visas are based on their employment or study in Yemen, marriage to a Yemeni citizen, or relationship to a Yemeni parent; or foreign residents who have pending legal action (including court-based “holds” on family members’ travel). The loss of a passport can result in considerable delay to a traveler because Yemeni law requires that the traveler attempt to recover the passport by placing an advertisement in a newspaper and waiting a week for a response. All minor/underage U.S. citizens should be accompanied by their legal guardian(s) and/or provide a notarized letter in Arabic of parental consent when obtaining exit visas to depart Yemen. In all of these more complex cases, obtaining an exit visa requires the permission of the employing company, the sponsoring Yemeni family member, the sponsoring school or the court in which the legal action is pending. Without this permission, foreigners — including U.S. Citizens — may not be allowed to leave Yemen. When taking pictures for your passport, be sure to hold on to the negatives so that if you lose a passport and the picture is pretty recent, you can just get pictures made from the negatives, insha Allah. This is handy if you have a lot of kids and don’t want to cart them in to get pictures taken. Be sure to pay special attention to the exit requirements as not knowing them can cause you delays in leaving Yemen. American women who also hold Yemeni nationality and/or are married to Yemeni or Yemeni-American men often must obtain permission from their husbands for exit visas. (This can be the case for American women married to Americans as well-TJYemen). They also may not take their children out of Yemen without the permission of the father, regardless of who has custody (see Special Circumstances section below). The 25th annual Sana’a Book Fair is going on October 15-26. There are 400 publishing houses participating in the book fair, according to a news brief. I have never personally been to one yet, so I am not sure if they have English books or not, I thought I had heard a sister say that they did have them, but not sure. If you are interested in going, its on Shariah Sitteen, at the Sana’a, Exphibition Center (not sure if that’s the correct name). If you are heading west on Shariah Sitteen, its after City Max, on the same side of the street, maybe 1/2 mile away (not too sure, but its not too far afterwards). You’ll see lots of cars and signs. I am not sure of the hours. If I go, I’ll post here, insha Allah on what I found. Some mirhads, like this one, flush. Others do not. So you need to flush with like a bucket of water. They can get really smelly if you don’t flush, so its a must. This is an average one like the ones that I have seen, but in older buildings they can look really nasty or just be not too much more than a hole in the floor. Fortunately, all the ones that have been in the houses we have lived in have been pretty decent and clean up pretty easily. This is typically how a bathroom will look in Yemen (below), with a mirhad and a toilet. 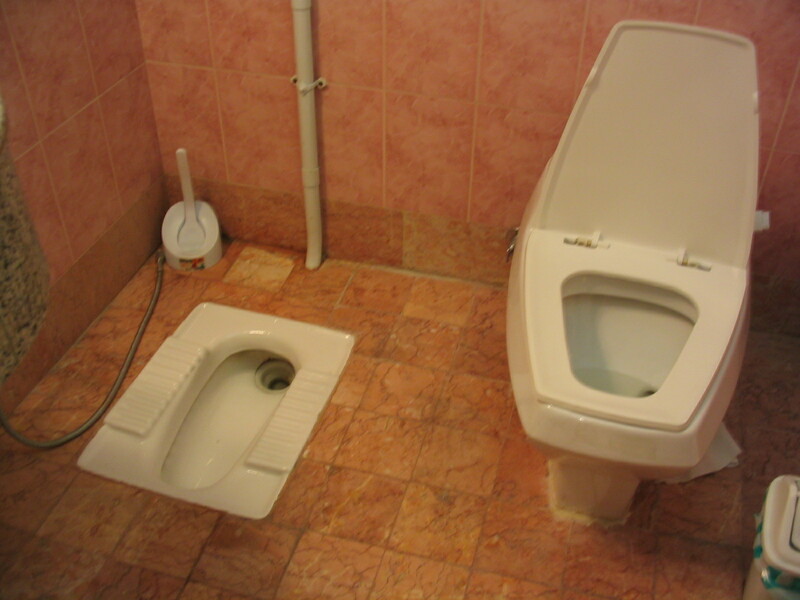 Sometimes there will be just a mirhad and sometimes just a toilet.